Type of works: supply of Tarkett Omnisports sports flooring, along with Tarkett Protectiles to give extra protection. After years of patching and repairing the floor in the sports hall at the Priory School, Edgbaston, it was finally agreed to re-surface. Since the hall is used for a variety of purposes from sports to exams, the school decided to install a specialist sports floor that could cope with multi-use. 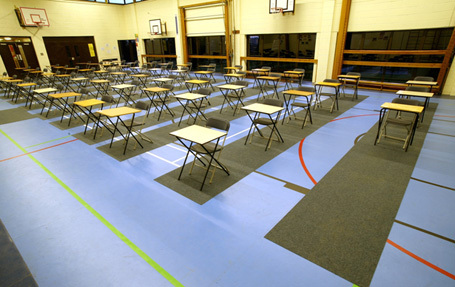 Tarkett Omnisports Training was specified to meet the sports performance requirements, along with Tarkett Protectiles to give extra protection during exams. Clarke Flooring carried out the installation, which involved first removing the old carpet and clearing any residue. A water-based screed was then applied before the Omnisports surface was installed. Tarkett Omnisports sports flooring is a virtually maintenance free, multi-purpose PVC sports surface that has been designed to accommodate a wide range of sporting events. The Omnisports range is available in four specific thicknesses to satisfy varying degrees of shock absorption and performance requirements. Omnisports Training is a 5mm thick surface ideal for multi-purpose spaces. When installed on a Tarkett Lumaflex base, the surface complies with EN 14904. Tarkett Omnisports surfaces offer an excellent, cost effective alternative to wood. All products are easy to install and feature Topclean XP, a sanitized surface treatment that reduces maintenance costs and resists development of bacteria and fungi. The highly cellularised acoustic foam also reduces the transmission of sound. In order to protect the floor when the hall is used for non-sporting activities, the school also purchased 140m2 of Tarkett Protectiles. These 1 x 2m tiles are quick and easy to install and remove. They are specifically designed to protect the sports floor from foot traffic and light furniture, such as chairs and desks, and are available in a selection of colours.